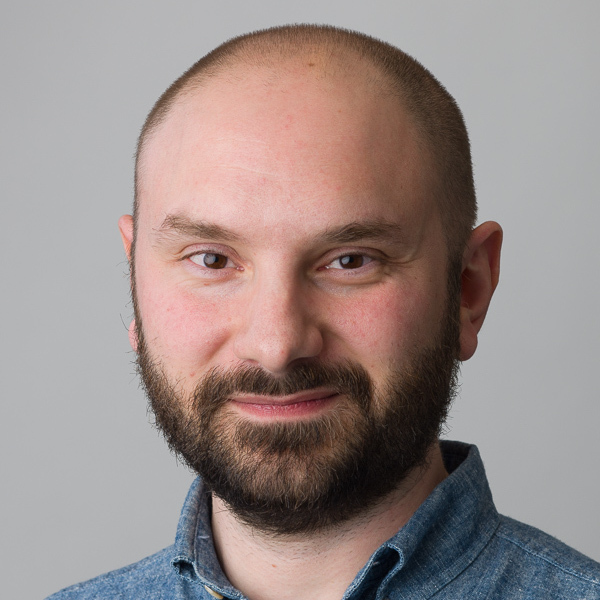 I am Enrico Glerean, I am a postdoctoral scientist working with Brains, Networks, and Behaviour. You can see the list of all my publication here. You can access my CV here. You can contact me here. You can access the code I wrote here. *Currently in press: “Maps of Subjective Feelings”. My main research interests orbit around these three keywords: Brain, Networks, Behaviour. These three elements and their multiple combinations are present in all my peer reviewed studies. Most of my research focuses on the human brain. As the brain is a network, I have developed extensive knowledge in brain networks from the level of neurons up to the large scale interactions between brain regions. I am particularly interested in subcortical areas and their role in cognition and psychiatric disorders. 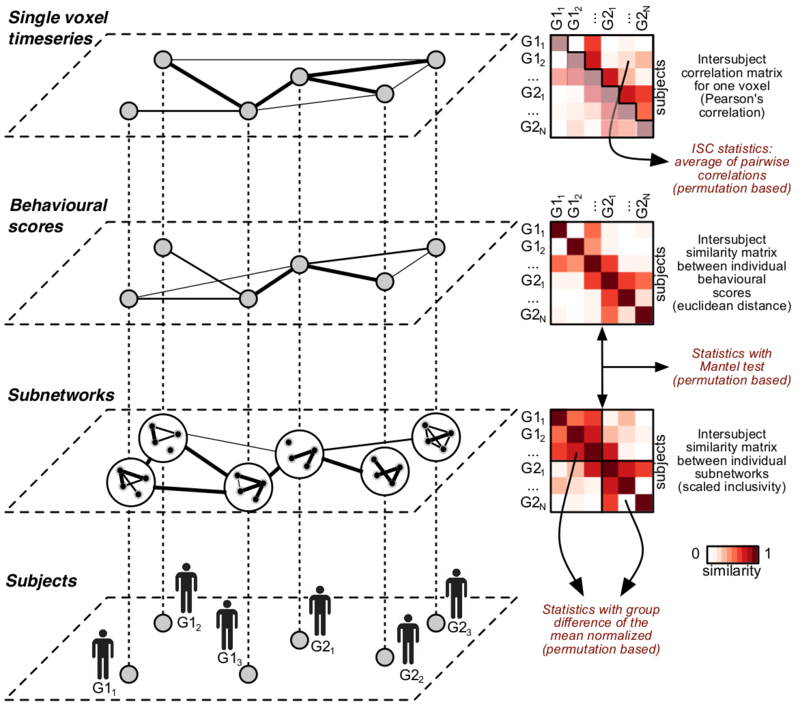 I also study the interaction between individuals using quantitative approaches, by modelling how more brains synchronise with each other with methods such as Intersubject Synchronisation and Intersubject Dynamic Functional Connectivity. I work with Magnetic Resonance Imaging (fMRI, sMRI, dMRI, MRA), Positron Emission Tomography (mu-opiod receptors, serotonin receptors and transporters, dopamine receptors), and sometimes also with electrophysiology (MEG, EEG). I also have a passion for meta-analysis and web-based tools to study and discover the vastness of brain imaging data. Finally, I am a strong supporter of measuring the brain during life-like naturalistic experiments, by using videos, audio narratives, and music. My previous research has greatly contributed to the field of naturalistic neuroscience both with stimulus modelling as well as brain data analysis. 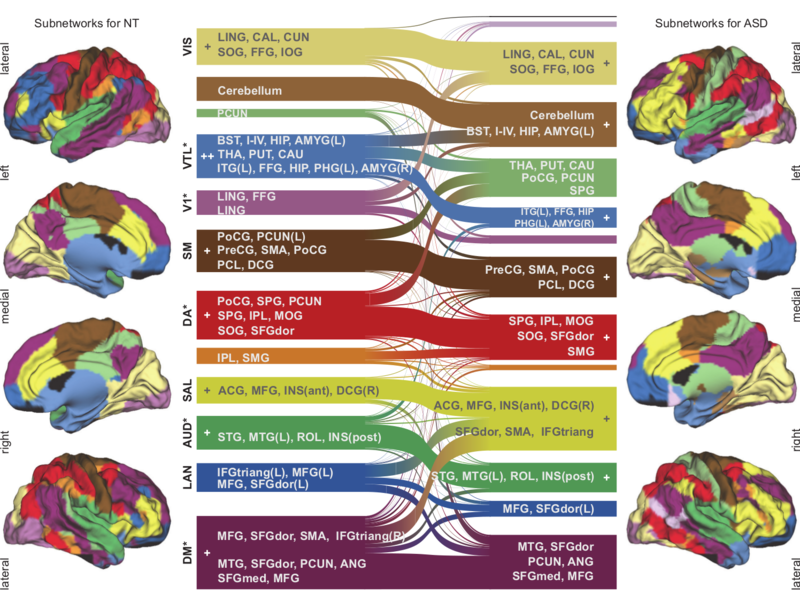 Functional subnetworks and their reorganization between typical controls (NT) and high functioning individuals with Autism Spectrum Disorder (ASD). Functional subnetwork similarities and differences between NT (left) and ASD (right) subjects. The subnetworks are color-coded and projected on lateral and medial surfaces of both hemispheres. The alluvial diagram in the middle uses the same color-coding. The height of each ribbon representing a subnetwork corresponds to the number of nodes that belong to the given subnetwork. Full figure caption here. Networks are ubiquitous. Furthermore, networks (graphs) are a powerful mathematical tool to model knowledge, social interaction, mental disorders and biological networks like the brain. I am specifically interested in multi-layer networks and how graph modelling of each layer can act as a bridge between phenotype, behaviour and brain-based measurement. 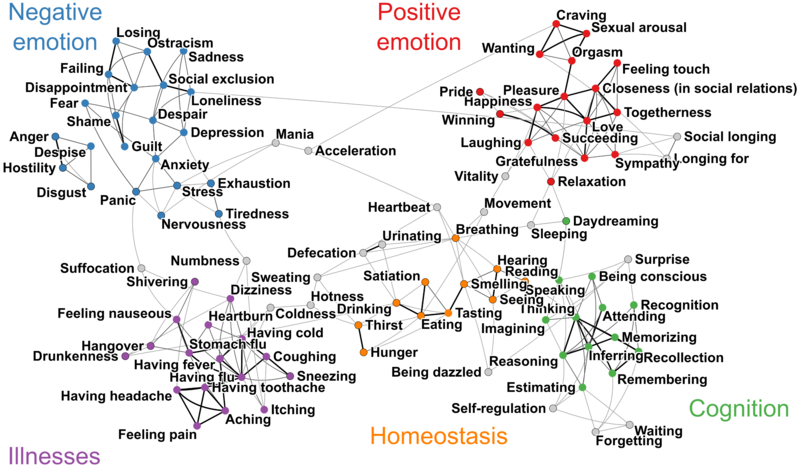 Network science is also a powerful tool to identify clusters and subtypes, which is important in mental healthcare as current psychiatric diagnoses are often too broad umbrella terms for different types of conditions. I work on network modelling with a holistic data-driven approaches (such as proposed by RDoC) to better understand clinical populations. A schematic representation of the intersubject analysis framework. For two groups of subjects (bottom layer, groups G1 and G2), we can compute the similarity between each subject pair by using functional brain data at the level of a single voxel (“Single voxel time-series” layer), using behavioral scores (“Behavioral scores” layer) or using more complex modeling methods (e.g. similarity at the level of subnetworks). These similarity layers are depicted as networks and as adjacency matrices also known, in this case, as intersubject similarity matrices. Three types of statistical tests can then be run (marked in dark red in the figure): a group difference within a layer, in which the within groups values of the adjacency matrix are compared (bottom adjacency matrix, where the group comparison tests whether the within G1 group similarity is higher than the within G2 group similarity). The second test is the Mantel test, in which two similarity matrices are compared with each other by correlating the corresponding values of the top off-diagonal triangle. In the latter case, also the between group similarity values are used making the Mantel approach more strict. The third test is the whole-group intersubject correlation, as the significant level of average pairwise similarity for a single voxel time-series as implemented by the ISC toolbox. Studying the brain without behaviour is like trying to understand a car without ever driving it. Behaviour is the most fascinating of the three concepts I am interested in, as it is at the core of us as human beings, alone or during interactions with others. I am interested in quantifying behaviour in life-like situations, possibly outside the lab or by using naturalistic stimuli (videos, audio narratives, music). Specifically, I am interested in emotions and the role of the body in our mental perception. I am also interested in quantifying behaviour with clinical populations, to design tools to aid individuals and their therapists in understanding behaviour using web-based and smartphone-based technologies. I have developed tools for self-reporting complex body responses due to emotions or other psycho-physiological processes. I have developed web tools for massive online data collection. I am also interested how individuals synchronise with each other using dynamic behavioural and physiological measures. Bodily topography of basic (Upper) and nonbasic (Lower) emotions associated with words. 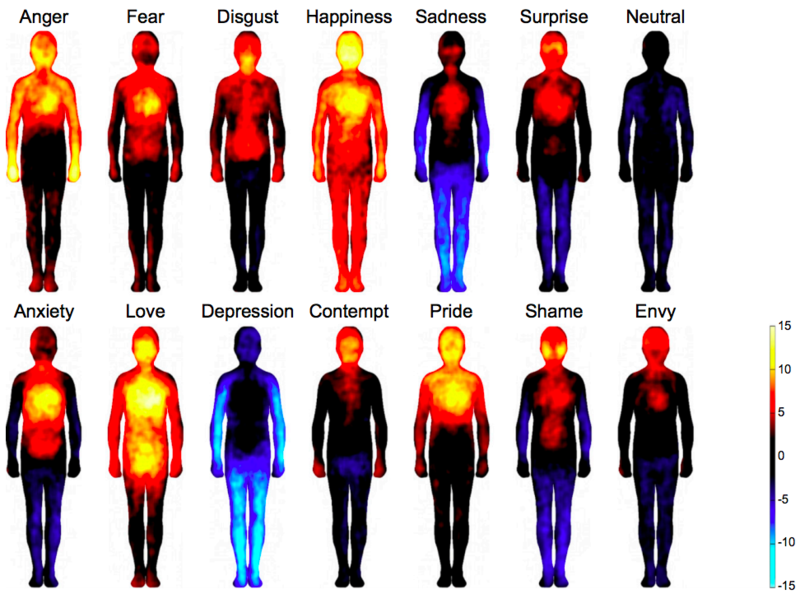 The body maps show regions whose activation increased (warm colors) or decreased (cool colors) when feeling each emotion. The colorbar indicates the t-statistic range. I was born in 1977 in Italy in a town close to Venice. I graduated in Telecommunication Engineering (University of Padua, 2002) and worked as a research assistant (2003-2004); research topic: patterns in time-series of internet traffic. In 2004 I left academia and moved to London to work for the IT industry until end 2007. I went back to academia studying for a second master degree in music cognition: Music, Mind & Technology (University of Jyväskylä). This led me to a research position as part of the aivoAALTO research team which ended up in 2015 with me completing a PhD (Doctor of Technology) with distinction at Aalto University School of Science (former Helsinki University of Technology) combining fMRI and complex networks methods to understand brain functions. I was a post doctoral researcher at Lauri Nummenmaa’s Human Emotion Systems Lab at University of Turku, and I am now a post-doctoral researcher with Jari Saramäki’s Complex Systems group at Aalto University. I sometimes work as free-lance software developer and system administrator for various IT companies. More info here. In my free time I enjoy travelling, swimming, cycling, making music, and playing with my two children (born 2014 & 2016).